Scientists at the Buck Institute for Research on Aging have promoted health and increased lifespan in Drosophila by altering the symbiotic, or commensal, relationship between bacteria and the absorptive cells lining the intestine. The research, appearing in the January 16, 2014 edition of Cell, provides a model for studying many of the dysfunctions that are characteristic of the aging gut and gives credence to the growing supposition that having the right balance of gut bacteria may be key to enjoying a long healthy life. Jasper says the bacterial load in fly intestines increases dramatically with age, resulting in an inflammatory condition. The imbalance is driven by chronic activation of the stress response gene FOXO (something that happens with age), which suppresses the activity of a class of molecules (PGRP-SCs, homologues of PGLYRPs in humans) that regulate the immune response to bacteria. PGRP-SC suppression deregulates signaling molecules (Rel/NFkB) that are important to mount an effective immune response to gut bacteria. The resulting immune imbalance allows bacterial numbers to expand, triggering an inflammatory response that includes the production of free radicals. Free radicals, in turn, cause over-proliferation of stem cells in the gut, resulting in epithelial dysplasia, a pre-cancerous state. April 15, 2019 - 'Harmless' microbe may cause death of good gut bacteria Medical News TodayGood bacteria are imperative for gut health. New research finds that another type of gut microbe could be endangering the beneficial bacteria population. April 16, 2019 - Treating diabetes by mimicking gut bacteria effects European BiotechnologyResearchers at University of Glasgow report that modulation of a specific GPCR results in health benefits normally mediated by a healthy gut microbiome. April 11, 2019 - Researchers look at the link between gut bacteria and autism Medical News TodayNew research looks at the effects of poor bacterial diversity in the gut in autism, suggesting a new treatment for gastrointestinal problems. April 15, 2019 - How does microgravity affect human gut bacteria during spaceflight? Information from the landmark NASA Twins study SciTech EuropaThe NASA Twins study has assessed the effect of microgravity on gut bacteria during spaceflight, which may give valuable insight for future travel to Mars. 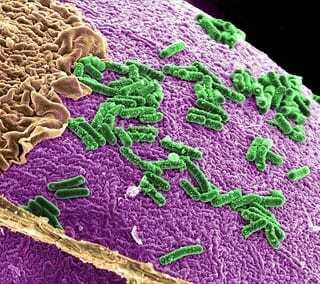 Is healthy aging predicated by the bacteria in your gut?